British Iroha is a band with a history. Members were active in Justin K. Broadrick projects Final and Godflesh. With the split album with Fragment and the first record they already proved how to mix shoegaze and metal in an enlighten way. Shepherds & Angels is their best work up till now and is heavy, fragile and melancholic at the same time. The tone of the voice is better as before when the first songs ‘The Great Healer’ and ‘You Reap what you Sow’ enters your dreamland domain. The fragile guitar tones together with the distorted ones feel as a warm bath. The slow music has similarities with the shoegaze genre but has a metallic guitar sound that Iroha can be positioned in the niche were Jesu also operates. Both acts share their love with eighties bands like New Order or My Bloody Valentine together with heavy guitars and slightly some electronic sounds. The ride of seven songs is one trip and the songs doesn’t differ that much. 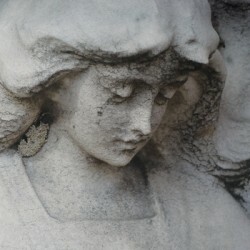 All are recorded with a drum computer but the melancholic edge and buzzing atmosphere doesn’t suffer from this choice. It impresses how the band keeps it interesting in the long songs that have the same type of chords and reverb on the guitar together with subtle electronic sounds. The highlight is the collaboration with Pyramids (yeah that band on Hydra Head that also did something together with Nadja). It has the typical Pyramids stamp on it. The fuzz that’s created around Iroha’s warm melancholic sound is wonderful and gives the record the perfect turn it needs. Shepherds & Angels is available in two different vinyl colors and a digipack CD version.